Welcome to the September issue. This month we have excellent articles including a management tip from Frank Christ on learning center mission statement, a tip on backpack weight from Lucy MacDonald , and a review of study skills web site by Susan Palau. Jeanne Wiatr and Barbara Stout are taking a break this issue. Their SI series column will be back next month. I was at the TRIO conference in Chicago last week, thus the delay in getting this issue out. Speaking of conferences, check the Conference Announcements section below for a list of eight conferences taking place next month. Do you have something to share with your colleagues? 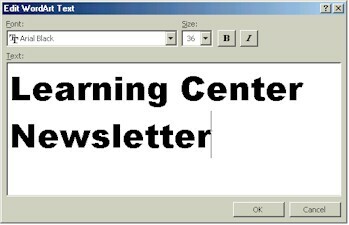 The Learning Center Newsletter is always looking for contributions. See the submission guidelines below. Enjoy the new issue, and don't forget to pass its web address to your colleagues. September marks the beginning of a new academic year. For most academic departments, including learning support centers, this is a time to rethink goals and objectives for the upcoming academic year. Perhaps I am being presumptuous in believing that all learning support centers already have a mission statement along with annual goals and objectives. If your center does not, now is a good time to consider developing a mission statement and concomitant goals and objectives. Whether or not your center already has a mission statement along with goals and objectives, you might consider reading David Gerkin's answer to the question, "What Management Tools May be Useful for the Success of LAC Programs and Services." It can be found in the recent CRLA publication, STARTING A LEARNING ASSISTANCE CENTER. You can find a description of this handbook and even order a copy of it, if you do not already own one, by going to the publisher's web site at http://www.hhpublishing.com and look under "Professional Development Resources." Look under "Sample Learning Center Mission Statements" in the site's "Resource Directory." As you develop or revise your goals and objectives, think programs and services, publicity, use of technology for online tutoring and web site design, staff training and development, and campus interrelationships with your center. Remember that your mission statement must be congruent with your institution's mission and that your goals and objectives are developed by you with the input of your staff and selected stakeholders such as faculty, students, and administration. Now, schedule a time and date this month to get together with your staff to develop or to revise a mission statement along with goals and objectives for this new academic year. HOW HEAVY IS YOUR BACKPACK? After all you need the essentials, like cell phone, keys, TI graphic calculator, palm pilot, cd player and CDs, wallet, credit cards, check book, computer disks, zip disks, stamps, glasses, planner, breath mints, aspirin, water bottle, gym clothes! Oh, of course, books. Now a Biology book for 1800 pages can weigh 5 lbs. And I need a notebook for each of my 5 courses and then all of my other books. Plus extra paper in case I run out. Sticky notes, highlights, pens and pencils in a canvas pencil case and a three hole punch and a stapler. Of course, I need extra staples as well. Oh... scotch tape, dividers for my notebooks - the ones with pockets in it, because teachers don't always punch holes in the handouts. Now, how heavy is my backpack? Some students are carrying 25% of their body weight in their backpacks and are wondering why they have headaches, backaches and are tired. Maybe it's time to get organized. Dump out your backpack. Do you really need a separate three ring binder for each class? Do you need to carry the binders with you or just a pad of three hole punch paper with a hard back for writing on those tiny arm desks. Then you can file your notes at night and maybe file them past the brain for a quick review. What about organizing your backpack for Monday, Wednesday, Friday classes and then Tuesday, Thursday classes. Survey your campus to see if you can find a midpoint for a locker between classes to offload some of the stuff. For some students, their car is their locker. Look at consolidating. Yes, you need highlighters, but twelve of them? Maybe your school supplies should be at your desk and only carry a few each day. Remember, carrying a 40 to 50 lb pack, doesn't mean your more studious or athletic! Put that backpack on a diet and get organized! I am probably the millionth person in your life to complain about how quickly the summer went. I assume that all of us are now open full time and are already experiencing a deluge of students interested in improving their academic performance. Or else we are being asked to present our learning centers and their services to the new freshmen. One way of not only providing a good service but also publicizing your Center is to invite the freshmen to your center to take a study skills inventory and handout out study skills tips in the areas they are found wanting. The Division of Student Affairs at the Virginia Polytechnic Institute and State University has a great website that opens up with a Study Skill Checklist and then depending on the results, directs the students to thorough but concise descriptions of good study strategies. The 21 question checklist covers the areas of Time Scheduling, Concentration, Listening and Note taking, Reading, Exams and Writing Skills. These are also the same topics that students can get in depth information on how to improve in these areas. To keep this website interesting, there are some interactive pages that allow the users to zero in on just how they manage their time and an evaluation of their study environment. For time management – making a long term schedule, intermediate schedule and short term schedule. Creating acronyms for remembering facts or sequence of items. Using a symbol, like an article of clothing or a figurine, that will serve as a ritual item to psych up the student for studying. A good description of the Cornell System for note taking. Instructions for reading and analyzing an essay. Techniques for reading difficult books. Ten Self-Care Techniques for Stress Management. The LCN is starting a new publications review program of software and books of interest to learning assistance professionals. The publications will be obtained from publishers and offered to educators for free. All we ask is that you write a review of the item for publication in the Learning Center Newsletter. If you are interested in becoming a reviewer, email reviews@accutrack.org with your contact and job information. If you are interested in a particular publication, include its name and publisher info. The conference theme is "Research 2001: Integrating Theory and Practice". The will focus on this integration for the purpose of highlighting current research in the field, sharing research-based classroom techniques, validating current instructional methods, and networking among professionals. The Learning Association of New England (LAANE) will have its annual conference at the Northeastern University in Burlington, Massachusetts. The theme for this year's conference is "Student Retention!" LAANE supports educators in meeting the academic and interpersonal needs of under-prepared, at risk, and nontraditional students. This also includes students with disabilities and those for whom English is a second language. Finally he decided the animal was old and the well needed to be covered up anyway, it just wasn't worth it to retrieve the donkey. He invited all his neighbors to come over and help him. They all grabbed a shovel and began to shovel dirt into the well. At first, the donkey realized what was happening and cried horribly. Then, to everyone's amazement, he quieted down. A few shovel loads later, the farmer finally looked down the well and was astonished at what he saw. With every shovel of dirt that hit his back, the donkey was doing something amazing. He would shake it off and take a step up. As the farmer's neighbors continued to shovel dirt on top of the animal, he would shake it off and take a step up. Pretty soon, everyone was amazed as the donkey stepped up over the edge of the well and trotted off! Life is going to shovel dirt on you, all kinds of dirt. The trick to getting out of the well is to shake it off and take a step up. Each of our troubles is a stepping stone. We can get out of the deepest wells just by not stopping, never giving up! Shake it off and take a step up! Stop web pages and ads from "auto-refreshing"
In addition to the above, Proxomitron also allows you to create your own filters or download filters other users have created. This makes it possible to customize the filtering to your needs. To use Proxomitron, you will need to change something called the proxy option of your browser. The program provides instructions on how to do this. The Start Menu button gives you a quick way of launching applications and opening files. So how do you add items to this button? The quickest way is to use Windows drag and drop. Simply drag the file, folder, or shortcut to your Start button and let go. The next time you click on this button you will find your item there! WordArt makes it easy to add catchy headlines and text to your document. 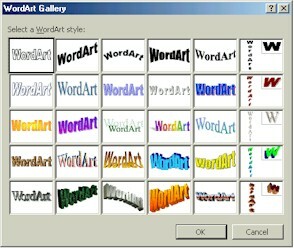 WordArt is a neat utility included with MS Word. 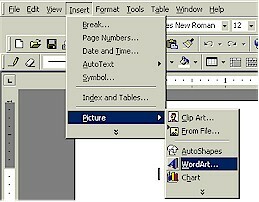 To launch it, click on "Insert", "Picture", then "WordArt..."
Using the toolbar, you can change things like colors, shading, orientation, spacing, alignment, and placement. Click on the different buttons on this toolbar to see what they do. The text wrapping option (dog icon) is of particular interest as it allows you to control how the WordArt object is going to be laid out in relation to the text of your document. "The textbook is almost useless. I use it to kill roaches in my room." "He teaches like Speedy Gonzalez on a caffeine high." "Help! I've fallen asleep and I can't wake up!" "The recitation instructor would make a good parking lot attendant. Tries to tell you where to go, but you can never understand him." "The class is worthwhile because I need it for the degree." "Textbook is confusing; someone with a knowledge of English should proofread it." "Problem sets are a decoy to lure you away from potential exam material." "He is one of the best teachers I have had...He is well-organized, presents good lectures, and creates interest in the subject. I hope my comments don't hurt his chances of getting tenure." "I would sit in class and stare out the window at the squirrels. They've got a cool nest in the tree." "Information was presented like a ruptured fire hose-spraying in all directions-no way to stop it." "I never bought the text. My $60 was better spent on the Led Zeppelin CDs that I used while doing the problem sets." "The course was very thorough. What wasn't covered in class was covered on the final exam." "Training is anchored to the past. Education looks toward the future." "Here is the secret of inspiration. Tell yourself that thousands and tens of thousands of people, not very intelligent and certainly not more intelligent than the rest of us, have mastered problems as difficult as those that now baffle you." "I don't care what you do for a living. If you love it, you are a success." "It is much harder to ask the right question than it is to find the right answer to the wrong question." "I have not the shadow of a doubt that any man or woman can achieve what I have, if he or she would make the same effort and cultivate the same hope and faith. What is faith if it is not translated into action." The third article in the Supplemental Instruction series. Time management web site review by Susan Marcus Palau. The newsletter is usually released during the first week of each month. The deadline for each issue is the 25th of the previous month, so if you would like to submit an article for the next issue, we need to receive it by the 25th of this month. By submitting articles, you give us the right to publish and edit them if needed. The subject of submitted articles must be of interest to learning-assistance professionals. The editor of this newsletter reserves the right to reject articles at his discretion. This newsletter is sponsored by AccuTrack and edited by Mon Nasser from Engineerica Systems, Inc. My thanks to this month's contributors: Frank Christ, Susan Marcus Palau, and Lucy MacDonald.